Stretching from 51st Street to 52nd Street on the east side of Fifth Avenue in 1899 was the Roman Catholic Orphan Asylum. Surrounded by a lush lawn and cast iron fence it faced Vanderbilt Row—the mansions of the Vanderbilt family that lined the west side of the avenue. Further down the avenue a troublesome trend had caught the attention of the millionaire family: the invasion of commerce. 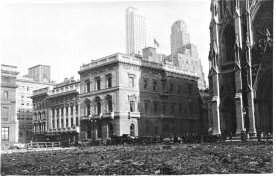 Six years earlier William Waldorf Astor had demolished his father’s mansion at the corner of 33rd Street to erect the hulking Waldorf Hotel. Already, in the blocks just below, grand residences were either being razed or converted to commercial structures. When the Orphan Asylum decided to relocate and the full block of valuable real estate was put on the market, George W. Vanderbilt went into motion, snatching up lots to prevent businesses from intruding on the exclusive residential neighborhood. Vanderbilt did not need to worry about five of the lots, however. 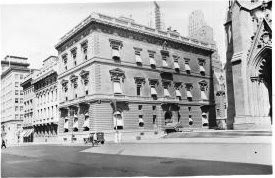 On December 21, 1899 the exclusive Union Club announced its intentions to purchase the three lots facing 5th Avenue at the corner of 51st Street, and the two adjoining lots behind. Steeped in tradition, the Union Club was not only the oldest but the most exclusive men’s social club in New York. Founded in 1836 at No. 343 Broadway, it moved northward rather quickly—to No. 376 Broadway in 1842 and to No. 691 Broadway in 1850. When the club moved into its quarters at the northwest corner of 5th Avenue and 21st Street in April, 1855, members felt they had a permanent home. A month after announcing interest in relocating, the contracts were signed. On January 18, 1900 the club agreed to the $700,000 price of the land—about $16 million by today’s standards. A competition among the architect members of the Union Club was initiated for the design of the new clubhouse. Crusty older members, rooted in tradition and uncomfortable with change, insisted that the old mansion at 21st Street be replicated. Nevertheless, the plans fell into two categories: a variation of the old clubhouse with changes made to the proportions to fit the new lot; and new, up-to-date designs with no nod at all to the old structure. In the end the Building Committee was deadlocked on its decision between two plans. One was a near-match of the old house, the other an Italian Renaissance palazzo. To break the tie, a disinterested party was called in. Charles F. McKim, of the esteemed architectural firm McKim, Mead & White, was not a member of the Union Club. He was shown the two plans and asked to make a judgment. He was clear in his preference. He chose the duplication of the old house. “Mr. McKim stated that there were faults of the plan which must be amended to make the structure suitable for its intended uses; but that its exterior was faultless,” reported The Times. Who, exactly, was responsible for the design is unclear. Cass Gilbert is widely given credit; however upon the death of Du Fais in 1935 The Times gave him full credit for the structure. Whichever architect was responsible—or perhaps it was a joint effort—the result was a dignified brick and limestone clubhouse that reflected the wealth and propriety of its members. From the moment the millionaire members walked through the front door of the new clubhouse, however, they were dissatisfied. The lots had been chosen primarily for the location across from the Cathedral. The committee had envisioned grand vistas down 5th Avenue from the windows of the lounges or club rooms for the members. Instead, the gentlemen had a view of the alley. The first floor facing the Cathedral was devoted to “the entrance, a strangers’ room, coatrooms, a cab stand, and the office,” he noted. The window of the lounging room where the members sat in leather chairs, smoked cigars and discussed business faced a ten-foot alley. “So far as they will commit themselves,” reported The Times, “the members seem to agree generally that the most important feature of the building, its potential view down Fifth Avenue, has been spoiled by the existing arrangement.” Some members fought for an additional appropriation of funds to completely reconfigure the interiors. Eventually the members became used to the new clubhouse and talks of remodeling died off. Names of potential new members were presented by existing members. Stringent investigation was conducted and voting was held. Membership was limited to no more than 1,500. Upon acceptance a membership fee of $300 was paid and annual dues of $75 were due every May 1st. The male-only stronghold hired only men to work in positions visible to the members—doormen, coat check attendants, waiters and butlers, for instance. The few women who were employed at the clubhouse worked in the kitchens or cleaned the rooms when members were not around. One of these was Annie O’Connell. On the night of February 19, 1905 the 45-year old woman approached the clubhouse around midnight to report to work. Lurking in the shadows was 21-year old Paul Heil who was quite drunk and mistook the Union Club for one of the great mansions of the neighborhood. When Annie O’Connell stepped towards the entrance, he grabbed her around the throat and attempted to throw her to the ground. He had chosen the wrong victim, however. The New York Times reported “She is strong and plucky.” After struggling for a few minutes, the Irishwoman was able to force his hands from her throat and screamed. Fifth Avenue was lined with coachmen sitting in the carriages of club members awaiting their owners. The drivers rushed to the sound of the screams and, although Heil pretended to have a gun and threatened to shoot, they overpowered the intended thief. Millionaires in evening clothes rushed out into the cold February air to assist the woman. Wealth and pedigree were not enough to guarantee a candidate’s acceptance into the Union Club. Hint of scandal or a stain on one’s reputation would result in rejection. To avoid the embarrassment of rebuff, a hint of the potential rejection would be leaked to the man to give him the opportunity of recalling his nomination. 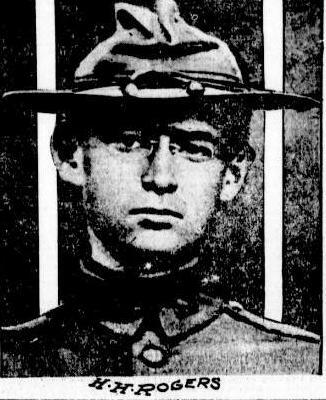 The socially-popular young millionaire was also a captain in the New York National Guard. His name was presented for membership by several other members. “His friends in the Union Club could not imagine any reason why he should not be an acceptable member and had no hesitation in setting the machinery in motion looking to his election,” reported The Evening World. Club etiquette demanded that no questions were asked regarding why a candidate should be refused. However Rogers had been involved in an ugly scandal in the Guard. When he and several other officers preferred charges again Colonel George R. Dyer a Court of Inquiry investigated. Dyer was exonerated and the accusing officers all transferred to different regiments; each one offering his apology to the Colonel. The breach in military and social etiquette was too much for the proper Union Club members and the socially eminent young man would not be admitted. To the socialists and communists of the early 20th century, the Union Club represented wealth and capitalism. On June 23, 1916 a mob of thousands marched up 5th Avenue to protest outside the clubhouse. The angry crowd “among whom were many anarchists,” said The World, filled the street outside. One unsympathetic club member stuck his head out of an open window and shouted “Go back to work!” and commanded the mob to disperse. He quickly ducked back inside as a derby hat flew past his head. For members of the Union Club, wealth and social position were essential. The threat of losing one’s fortune and esteem were often too much to bear. Member Otto Zurcher lived just down the block at No. 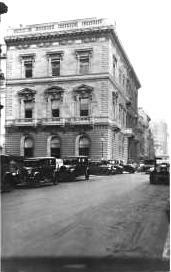 33 West 51st Street in January 1919. Born in Switzerland, he had made his fortune in African and South American sugar plantations. With the war, however, he sustained heavy losses. Before the ambulance arrived, the former millionaire was dead. Throughout the war the Union Club flew the flags of the country’s allies, France and England, alongside the American flag. A year after the end of the conflict, the flags were still displayed. This caused a problem in November 1920. A mass was celebrated in St. Patrick’s Cathedral for the deceased Lord Mayor of Cork, Terence MacSwiney. Hundreds of members of Sinn Fein filled the cathedral and the British flag caught their attention. Before long 5th Avenue was filled with angry Irishmen who pelted the building with stones and bricks, shattering windows. Sinn Fein’s violent protest was balanced by another, more peaceful one, soon thereafter. Shortly after traffic resumed on 5th Avenue an automobile pulled up to the curb by the clubhouse. General George Robert Nivelle, at one time the Commander of the Legions of France, stepped out. The soldier stood at attention and saluted the flags of the United States, France and Britain. “Whatever recollections the evidences of destruction at the club aroused in the breast of the General were kept to himself, as he made no comment, and, after one brief survey, the automobile sped on,” said The New York Tribune. George Vanderbilt’s twin marble mansions had been converted to an art gallery and Morton Plant’s grand mansion was now the home of Cartier jewelers. As it had done on 21st Street, the Union Club decided to remove itself from the now-commercial district. Members pasted bids on the huge leather chairs and other upholstered pieces they hoped to purchase as mementoes. One member placed a $300 bid on the marble fountain at the foot of the staircase in the entrance hall. Other historic pieces—portraits of club presidents dating back to 1836, silver desk sets, candlesticks and a seal—that had come from the 21st Street clubhouse were to be transferred to the new building. New Yorkers held their breath as the vacant Union Club was threatened with demolition to save taxes. Then in June it was announced that the Grand Central Art Galleries would take over the building as its new home. The gallery stayed on in the building for many years; but by 1944 it sat empty. That “imposing edifice” lasted until 1975 when the 51-story glass-and-steel Olympic Tower was built. The soaring building makes it difficult to imagine a time when millionaires alighted from carriages to enter an Italian palazzo surrounded by the mansions of New York’s wealthiest citizens.